Investors have myriad choices for their investable assets, and those that have an interest in a particular industry sector can certainly find investments to fulfill that objective. This targeted investing plays a significant role in the stock market, where investors try to determine what industry sector is in line for notable growth. Advisors working with investors who want to point their investments in a particular direction will have an easier time satisfying those clients. That being said, advisors need to be aware of current events that could affect the industry an investor has an eye on. Spectrem’s wealth segmentation series study Asset Allocation, Portfolios and Primary Providers asks investors what industry sector they would look to invest in during the upcoming months. The research is valuable to advisors who work with investors who prefer a targeted investment plan. 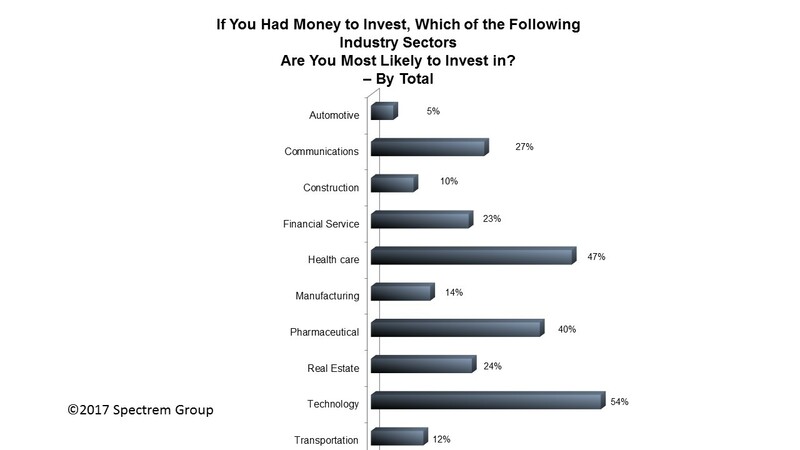 It includes breakouts based on age and occupation, both which appear to influence in one industry sector over another. The role advisors play in an investment plan targeted toward a particular industry sector is to know which companies or investment products are the best option or what to steer clear of. Among Millionaire investors, those with a net worth between $1 million and $5 million not including their primary residence, the most popular industry sectors in late 2016 was technology (54 percent of investors said they had an interest in investing there) and health care (47 percent). The health care choice is an interesting one considering the tumultuous changes promised for the Affordable Care Act under President Donald Trump. There are probably good investment opportunities in that sector, just as there are probably investments to shy away from because of uncertainly. Investors with an interest in investing in health care companies will be looking for knowledgeable guidance. The technology sector also could be a sticky wicket for unaware investors. Advisors may already be aware of the hot- and cold-running technology stocks, but the technology industry historically has a “pogo stick” atmosphere, and investors need to know which company provides the most stable investment environment. Of course, it may be the volatility that makes some industry sectors more attractive than others. Forty percent of Millionaires seek investments in pharmaceuticals, an industry that is under constant fire for prices and rampant medical costs. This industry, too, could be affected by changes in the ACA. Twenty-seven percent of Millionaires expressed in an interest in investing in the communications sector just as the federal government ponders continued attempts at mergers among the largest media companies. Just under one-quarter of Millionaires expressed an interest in investing in the very stable growth market of real estate. Having clients who want to target certain industry sectors could be interesting for advisors, but it requires a great deal of attention to industry detail. If an investor wants to invest in a particular company, that it is easy. Investing in a particular sector could be accomplished through mutual funds and could be less volatile. Several other sectors are mentioned in the Spectrem study. Advisors can examine those less-popular sectors and see if there is one that they know has good, if not great, growth potential.